CSIRO's 28-year-collaboration with Boeing has soared to new heights with the aerospace company naming CSIRO a "Supplier of the Year" for calendar year 2016. Outstanding performance in research and development, including a breakthrough innovation to keep Boeing's employees safer, were cited as some of the reasons for CSIRO being given the Technology Award, which was announced at a ceremony this week in Dallas, Texas. Boeing's Technology Award is reserved for the partner which has shown outstanding performance and "been instrumental in the introduction of new products to meet Boeing's current and future business needs". For CSIRO that's meant developing technology to keep Boeing's employees safer and meet strict environmental regulations such as new hydraulic fluid for planes, and replacing a commonly-used corrosion inhibitor used by the aviation industry with a safer alternative that provides better performance. "Boeing's success is a testament to the partnerships we hold with the finest aerospace suppliers in the world, such as CSIRO," Boeing leader for enterprise Supplier Management Kent Fisher said. "Together we will continue to deliver affordable, technologically advanced products and services that give our customers a competitive edge." CSIRO is one of 13 recipients of the Boeing Supplier of the Year Award, which recognizes strong performance and close collaboration that helped Boeing exceed customers' expectations in 2016. Boeing has more than 13,000 suppliers from all 50 US States and 48 countries. Supplier-provided components and assemblies make up approximately 65 per cent of the cost of Boeing products. "Over 28 years we've evolved from vendor to true partner. We are so much stronger together. Boeing allows us to turn excellent science and clever ideas into industry leading technology that changes lives," CSIRO's Chief Executive Larry Marshall said. "When you have a century of commitment to trying new things, placing the customer first and collaborating with equally passionate partners, you develop a culture of believing that anything is possible. That spirit is at the core of our partnership with Boeing." The Boeing relationship is one of CSIRO's most enduring and productive. Since 1989 the organisations have invested in projects that take in everything from software to safety systems, cyber security to space science, production efficiency to advanced materials. CSIRO was previously awarded a Boeing "Supplier of the Year" award for calendar year 2010 in the academic category. "We help Boeing deliver profound value to their customers and ensure our innovation benefits Boeing's bottom line," Dr Marshall said. "To top it all off, we also improve Boeing's environmental impact." 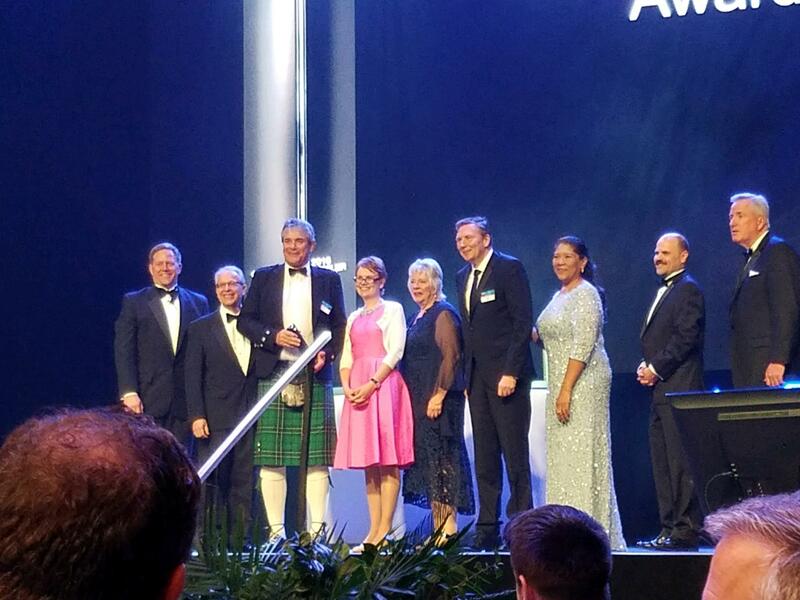 CSIRO Chair David Thodey, CSIRO Commercial Director Tristy Falkenberg (4th & 5th from Right) and CSIRO Manufacturing Director Keith McLean (3rd from Left) receive the award in Dallas. 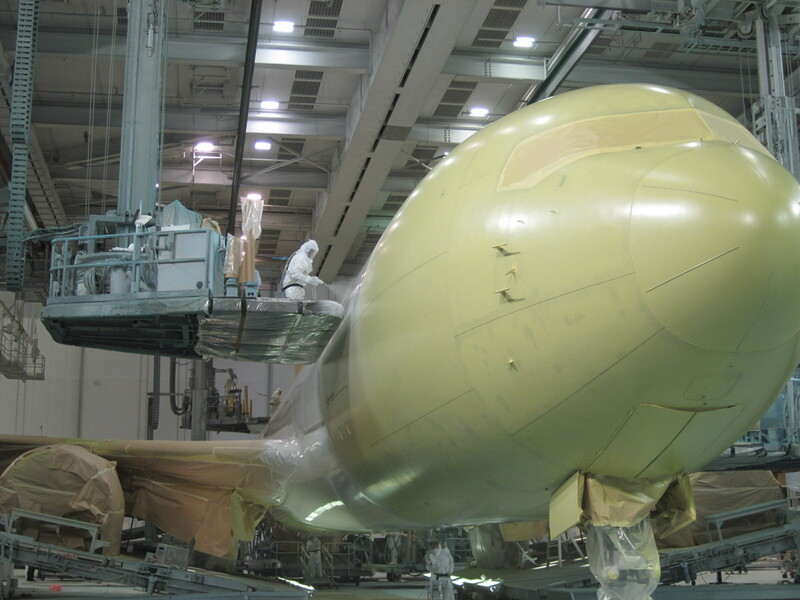 Spray-on topcoat for aircraft - Our cost-effective topcoat technology is reducing environmental impact and improving worker safety in the aviation industry.